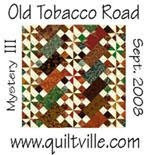 Gyleen Fitzgerald hosted a mystery quilt starting first of June. Yea, I am finished (with the top) before the end of June. Which was the goal. 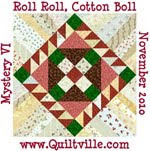 Supposed to make a pieced backing by her method. So, that will come together in a few days. Maybe! The wind kicked it up just a little, dont you love Wayne's feet. LOL I took another picture, but the color was faded looking. The sun is just a little too bright to get a great pic. Hope you like it, was fun to make. Baby Quilt for our sons friend. Arron and his wife had a little boy in May. He was due in June, so I was running a little late on this one. William came home for fathers day on Friday. He only had 24 hours off work. I only had half the binding sewn. So, like a good mom, after supper I sat down to finish with the TV on and a movie. What should happen next. Thunderstorm, very close. I almost jumped out of the chair. Power went off, and here I had this quilt to finish. We are at the end of the power company so there was no telling when it would come back on. Wayne (DH) and William (DS) got the oil lamps and candles out. It wasnt quite enough light (how did our ancestors do it) I took one of those small led flash lights and propped it up under my chin. That gave me light directed right where I was sewing. William played the piano by candle light and we talked. It was great fun after all. I do love my family. 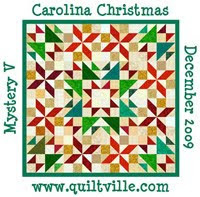 Arron got the quilt the next morning as William headed back to Brevard NC he stopped in Columbia to see Arron and gave him the quilt. The other story is that Aaron and his wife both work at the zoo in Columbia. I found a cute animal print and the back has penguins on it. Their favorite.